Economy Vinyl Vests: The vinyl vests are available in both safety orange and bright yellow, plain or with VOLUNTEER imprinted in black on the back side. There is a tie lace in front to help keep the vest snug. 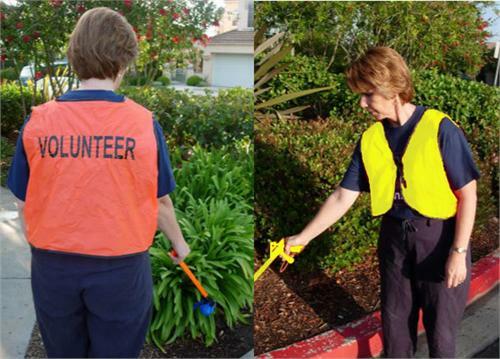 These are an inexpensive way to identify who you staff and volunteers are at clean-up events along the beach, rivers, or in parks. Great for festivals, concerts, and other outdoor events. Not suitable for along highways. Please see our selection of ANSI Class 2 vests for roadside and highway use. Size LARGE only. Not suitable for additional screenprinting.